Click to expand the job descriptions. We’re hiring an AmeriCorps Member for Summer 2019! The Summer Ladders AmeriCorps Member will support youth to acquire critical knowledge and skills to mitigate summer learning loss by developing and facilitating high-quality activities that promote increased social, emotional, math, and reading proficiency. *Benefits also include the possibility of student loan forbearance. Utilize the Dimensions of Success program development tool to develop high-quality lesson plans in the areas of social and emotional learning, reading, and math, as determined by the host site. Collaborate with Iowa Children’s Museum (ICM) leaders and front line staff to integrate lesson plans into summer programming, as well as archive lesson plans for use over the school year. Prepare and implement high-quality activities with youth. Develop strong relationships with youth, program staff and leaders, and organizational leaders to foster a positive learning environment. Provide a safe and supportive environment for youth attending ICM programming. Ensure youth emotional and physical safety, security, inclusion, and engagement by adhering to host site rules of conduct and completing Summer Ladders and ICM training. Act as a role model and informal mentor to youth attending The ICM by modeling appropriate behavior including inclusivity, leadership, and full engagement at all times. Maintain youth and family confidentiality. In addition to the other duties listed above, the Summer Ladders AmeriCorps member at The ICM will be trained as a PLAYologist. PLAYologists are the front line staff at The ICM and provide the primary staff interaction with families and museum exhibits/programs. PLAYologists exemplify outstanding customer service by maintaining cleanliness in exhibits, assisting with special programs and modeling learning through play. All PLAYologists must be self-motivated, friendly, energetic, collaborative and creative individuals who enjoy working in a family-friendly, informal learning environment. Applicant must be a U.S. Citizen or lawful permanent resident. Applicant must pass a three-part Criminal History Background Check due to recurring access to vulnerable populations. College coursework in education or related field. Experience with youth in an educational or child care setting. At The Iowa Children’s Museum, we strive to provide a rich active learning environment that fuels children’s natural curiosity and creativity. The Museum is an engaging, multi-sensory, interactive, child-centered environment offering families unique opportunities for playfulness. Come play! To apply, please submit your cover letter and resume to Jeff Capps, executive director, at jcapps@theicm.org no later than Monday, April 29. Candidates should be prepared for the possibility of phone/in-person interviews and a more extensive online application. Thank you for your interest! Guest Welcome Center Specialists are friendly individuals with excellent communication and people skills, customer service and cash handling experience, and knowledge of all things loca. As a Guest Welcome Center Specialist, your position is threefold: part ambassador of The Iowa Children’s Museum, part “Concierge of Coralville,” and part visitor experience expert and customer support for Coral Ridge Mall. Part-time, but could be a full-time position with benefits for the right person! 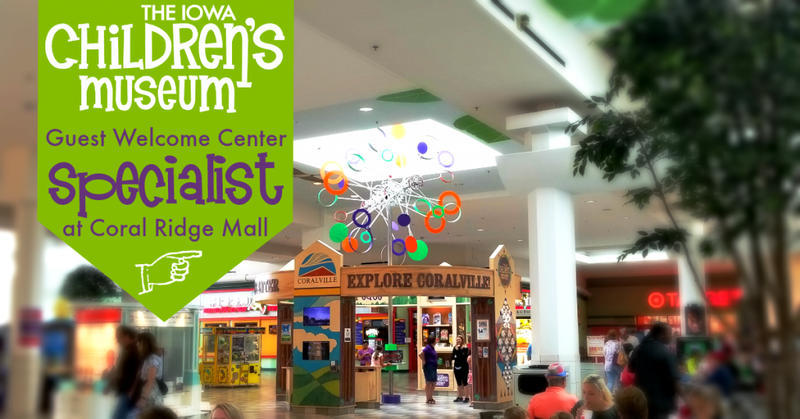 This position is responsible for diverse aspects of managing the Guest Welcome Center at Coral Ridge Mall to support the mission and vision of The Iowa Children’s Museum. Areas of concentration include, but are not limited to implementing the museum marketing plan and fulfilling GWC obligations to Coral Ridge Mall and the City of Coralville. To apply, please send your resume, cover letter, and completed employment application to Jessica (Hansen) Reuter, Director of Marketing, at jhansen@theicm.org. PLAYologists are the front line staff at The Iowa Children’s Museum and provide the primary staff interaction with families and museum exhibits and programs. PLAYologists are the front line staff at The Iowa Children’s Museum and provide the primary staff interaction with families and museum exhibits and programs. PLAYologists exemplify outstanding customer service by working at our admissions desk, maintaining cleanliness in exhibits, assisting with special programs, facilitating birthday parties, and modeling learning through play. All PLAYologists must be self-motivated, friendly, energetic, collaborative and creative individuals who enjoy working in a family informal learning environment. Exemplify outstanding customer service with museum guests and other staff. Engage with children and their adult caregivers actively through play in the exhibits. Work at the admission desk and greet every guest with a smile, take payment for general admission and gift store sales and answer questions about the museum, including special programs. Keep the museum a clean place to play by resetting exhibit props and performing daily, weekly, and monthly cleaning tasks. Assist with museum opening and closing procedures, including sanitizing, resetting exhibits, restocking supplies and maintaining staff and guest restrooms. Facilitate birthday parties by guiding party guests through child-directed play in the exhibits and special facilitated activities in our birthday party rooms. Appreciate that The Iowa Children’s Museum provides a fun and safe place where unstructured and informal learning is nurtured through the Power of Play. To apply, please send your completed employment application (cover letter and resume optional) to Gretchen Kemple-Taylor, Director of PLAYology, at gkempletaylor@theicm.org or drop your application off at the front desk.